Here's how you can use Gmail's swipe gestures. You can decide if you want to mark a message as read, movie it to a folder or delete it outright, among other options. This could come in handy when you have loads of emails to sort out. It is very easy to configure the new swipe action feature. "You can now set up swipe actions in Gmail on iOS to do any of the following actions: Archive, Trash, Mark as read/unread, Snooze, and Move to", said the G suite blog post. Google says the feature will rollout to all iOS users over the next 15 days - so don't stress if you don't see the new feature right away. A few of the partners that have signed up to dynamic emails on Gmail include, Booking.com, Despegar, Doodle, Ecwid, Freshworks, Nexxt, OYO Rooms, Pinterest, and redBus. 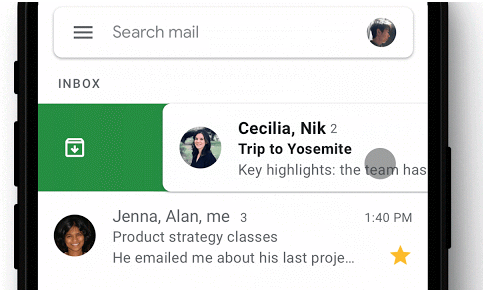 Google free email service, Gmail for iOS has been updated with customisable swipe actions. Before now, the menu was limited to a couple of options, which of course, did not help much. It is worth adding that swiping for each email is present in Gmail's iOS app but swiping either left or right will show you the same function.